We had a great weekend. 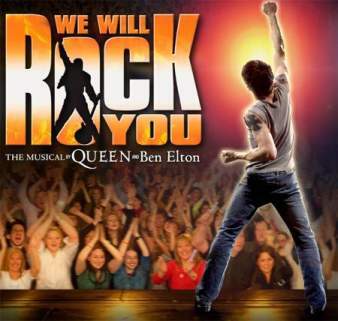 Friday was interesting for me, as I went out to the Esplanade with my boss, a colleague, and my boss’ friend to see “We Will Rock You,” a musical based on the music of Queen. It was really good fun. Enjoyed that, went to Chinatown to a salsa club, left after a while and went home. Yay. Sunday we mostly just hung out at home. The most interesting thing that happened was that I played Monopoly with Zen for the first time. It was Spider-man Monopoly, so it is “theme Monopoly.” I bought lots of property while Zen was more prudent with his money. He ended up paying me a lot of rent. I would have done very well if we’d played another hour, but we stopped playing after three hours. Zen went to his swimming lesson, and I continued to read Harry Potter. Nice weekend nice night. We Will Rock You! – The musical was really great fun. Besides the fantastic music of Queen, which needs to be appreciated in a grandiose setting, the musical featured a libretto by Ben Elton, who is the guy behind a lot of Rowan Atkinson projects like Black Adder and Mr. Bean. So it was funny as well. The plot is about a day in the future when music is outlawed and people have forgotten how to rock. But a savior arrives like Luke Skywalker/Neo/Harry Potter to inexplicably teach everybody how to defend people from the clutches of the killer queen. Yes, the plot isn’t fantastic and it seems to have been lifted from Styx’s “Kilroy Was Here” (which was probably lifted from somewhere else), but it is good fun for all of the jokes and musical references. And of course the music is fantastic. Unfortunately, the lead dude is not very commanding, but plenty of the other cast were really good. Yes, they did rock me. – good fun. It takes a while to imagine a world-on-its-head situation where horrible monsters are terrified of cute little kids, or to comprehend a world where baby screams can produce electric power. The monster world is as charming as Bedrock in many ways, and the voice actors are all fine – John Goodman, Billy Crystal, Steve Buscemi, James Coburn (James Coburn! Flint!!) and others. Happily, the film is not too long, and picks up after the first 30 minutes or so. Sure, 30 minutes is a long time to sit through intro, but other films take even more time to get going. But this film is really more for the kids, with very little for adults to dig, unfortunately, since Pixar films usually specialize in having something for both. Sweeney Todd: The Demon Barber of Fleet Street – I thought that this was just about the most repulsive movie I’ve ever seen, and not just because it was a musical! The blood and guts were a bit much and all of the throat slitting and waterfalls of blood was repulsively excessive, not to mention the awful, soulless “songs” that they sang! I thought it would be good fun watching Sacha Baron Cohen in a movie where he wasn’t Borat or Ali G, but the “duel” that he “fought” with Sweeney Todd just didn’t make any sense. Helena Bonham Carter, who is very attractive, is difficult to look at when she’s made up in Marilyn Manson corpse make-up. I thought that Tim Burton would try to infuse at least some sort of dark humour into this story of a sort-of-sympathetic serial killer, but I’m not sure he even tried this time around since the film is really as gothic as it wants to be. Not recommended. This entry was posted on Tuesday, April 15th, 2008 at 2:48 pm	and is filed under Uncategorized. You can follow any responses to this entry through the RSS 2.0 feed. Both comments and pings are currently closed.